For over 30 years, Metal Technology Ltd is one of the UK and Ireland's leading architectural aluminium systems companies. Since its inception in December 1985, Metal Technology is now one of the UK and Ireland's leading designers and suppliers of bespoke architectural aluminium window, door and curtain wall systems. Annual installations exceed 90 million pounds and the company operates daily dispatches to the UK and Ireland from its three acre manufacturing and distribution headquarters in Northern Ireland. While Metal Technology has always focused on innovative designs, it has never lost sight of its capabilities in the production department. The company's success has been built upon a core focus and investment in support, product development and reducing the environmental impact. It is probably due to that company philosophy that Metal Technology crossed the path of Aluro. Calvin Wilson, Managing Director: “Metal Technology celebrated its 30th anniversary last year, and you can imagine the business has changed immeasurably in the past 30 years. In the late 1990’s, polyamide was in its infancy in the UK market, and we quickly understood its potential. Even though only a small portion of our profiles were being isolated with polyamide at the time, we had a long term strategy with Metal Technology and started analyzing suppliers who could provide us with the technology and equipment which we hoped could be used for many years to come. That’s how we came across Aluro, who – 17 years ago – was already one of the key players in the market. On our way to an international tradeshow, we made a stopover in Belgium, and visited the Aluro facilities. Initially, our purpose was to get a demonstration of their BTM. 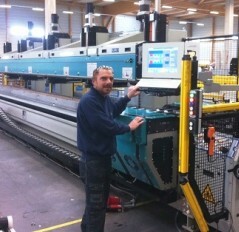 However, a huge machine in the back of their factory caught our eye. It was the Aluroller. They showed both machines to us, and even though the BTM met our requirements, the Aluroller presented opportunities which we believed were at a different level to anything we had seen. After our meeting, we continued our journey to the tradeshow where we met with other potential suppliers, but nothing came close to matching the Aluroller. So in the year 2000, our first Aluroller was installed. 6 years later, we added our first BTM. Both machines are still being used today. Last year, we received news from Aluro that a new machine would be launched, and this triggered our interest since the time was right for a new investment. From our first discussions, it became clear that the Aluroller EVO was going to be something completely different: faster, more flexible, more ergonomic than anything in the market. So our expectations were high, to say the least: with the Aluroller EVO, we would not only be able to improve our productivity, our set-up and changeover times, the ergonomic conditions for our operators would be a significant benefit.. We would also be able to experience lower tooling costs than with our existing Aluroller. The Aluroller EVO has certainly delivered. It was installed in early 2016. Training went very well, and even though our initial set-up has taken up quite a bit of time, it is already clear that we have indeed increased our productivity. The feature of the Lift-Assist also helps our operators in terms of Health & Safety aspects. We are scoring better on set-up times as well as on actual production time and output. For Metal Technology, Aluro has proven itself as an excellent supplier for many reasons. You have to bear in mind that we are now using our BTM from 2006, as well as our Aluroller from 2000, and the Aluroller EVO from 2016. So we are in a perfect position to compare all 3 solutions from a technical and financial point of view. If you do the calculations, you need 4 to 5 operators to use the BTM, or any similar machine for that matter. As our business grew, the BTM was used quite frequently. But the Aluroller simply uses less personnel, and the 2 operators it requires can execute more tasks, including packing for example. So if you include the labour cost in your financial analysis, the Aluroller is much more beneficial. Today, our BTM is only a back-up. We have expanded our production facilities in recent years and with both the old and new Aluroller, we have increased our productivity and capacity quite dramatically. The old and new Aluroller are now running side by side. With over 300 different profile types and strips of 20 to 35mm high, set-up and changeover times are very, very important to us. Moreover, we have various lengths, various colours, and a requirement for dual coloured profiles. And while we insulate for stock we also organize our production process per project. Therefore adaptability and flexibility are key factors in our process. I am convinced that we can only manage this with our Alurollers. It is our company‘s philosophy to not only focus on R&D, but also investigate whether new profile and isolation types can actually be produced in our production department. We also develop lot of bespoke designs, which often are exclusively used for one customer or one project. Until early this year, we were limited to what our machines could do. 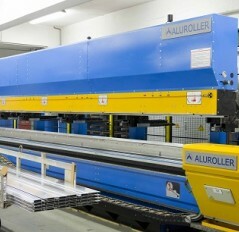 With the Aluroller EVO, we can increase our production capabilities and we get so much more flexibility. This will influence what we can design and market without restrictions. The Aluroller EVO has the ability to handle all the profile types we currently have, regardless of their complexity or extrusion tolerances. In conclusion, it has been an exciting journey with Aluro. They have proven themselves to be an intelligent team of people, who continuously raise the bar with cutting edge technology.